World championships medallists Mo Farah and Jessica Ennis were named athletes of the year for the second year in succession by the British Athletics Writers’ Association at the organisation’s annual awards event staged in a restaurant on Leadenhall Street in the City of London yesterday. Last year, Ennis was a unanimous pick for the athletics writers’ award, while Farah had to overcome close competition from 400 metres hurdler Dai Greene. This time it was Farah who was the runaway winner, the 5,000m world champion taking the men’s award for the third time, while Ennis clinched the women’s title for the third year in succession winning by just two votes from world 1,500m runner-up Hannah England. The honour caps a magnificent year for the 28-year-old Farah, who not only took the 5,000m title at the world championships in Daegu but picked up silver in the 10,000m after a narrow defeat to Ethiopia’s Ibrahim Jeilan, as well as retaining his European Indoor 3,000m crown in March. The US-based west Londoner also broke European records for 5,000m indoors and 10,000m, improved the British 5,000m record outdoors, and set a British half-marathon record on his debut at the distance in New York. Greene, the 400m hurdles world champion, was runner-up in the BAWA’s male vote for the second year in a row, while Phillips Idowu, the world triple jump silver medallist, was third. Ennis retained the women’s trophy by a narrow margin after taking silver in the Daegu heptathlon behind Russia’s Tatyana Chernova. With three BAWA awards to her name, the 25-year-old from Sheffield is now only one behind another multi-eventer, Denise Lewis, the 2000 Olympic heptathlon champion. England finished second in the women’s vote after claiming a world silver medal with a dramatic finish in Daegu, while Helen Clitheroe was third following her heart-warming victory over 3,000m at the European Indoor Championships. Clitheroe’s Paris win also earned the 37-year-old from Preston a special honour as the first ever winner of the new BAWA Inspiration Award, given in recognition of an athlete who made an outstanding performance in a single event, performed well against the odds, or is retiring after a long and distinguished career. 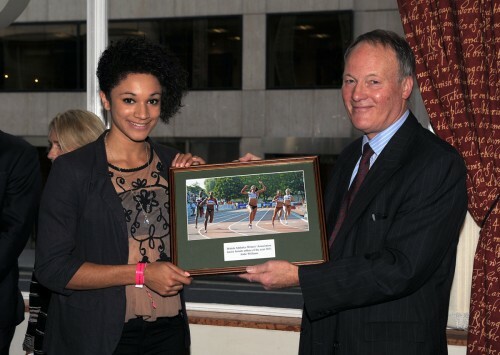 Jodie Williams won the Lilian Board Memorial Award for junior women for the third successive year, the first ever to do so. The sprinter from Herts Phoenix AC this year won the 100m and 200m double at the European junior championships in Tallinn. The Ron Pickering Memorial Award for Services to Athletics was presented to Dave Bedford, race director of the Virgin London Marathon. The former 10,000m world record-holder will step down as race director, following next year’s event on Sunday 22 April, but will continue to work with the event.